From time to time we take group photographs to update our web site and also SRSB's web site. Any members who do not wish their photos to be on the web site please contact Gail - details above. This is me.... With all those people who were also auditioning for a year's contract with BBC Radio Sheffield, it was very nerve racking. I predicted correctly that I did not stand much of a chance as they were looking for a specific type of person. I am so glad I had the chance, as it has given me a foot in the door and I know now that working in radio is what I want to do. Some of you may remember the delightful young lady Dr Sarah Bell who came out walking with us last year and has sent us this link. Sarah ran an event in Bristol in September around promoting more inclusive opportunities for adventure nature activities with sight impairment. We've uploaded a short edited podcast of some of the main discussions from the event to the Sensing Nature news page in case it's of interest at all! 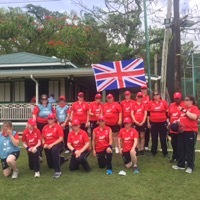 MARTIN'S STORY - Bowled over in Barbados - SRSB client and volunteer Martin Wilson has just achieved what must be every cricket fan's dream trip - an international tour against the West Indies. He spent ten days out in Barbados as a coach for the UK Women and Girls Visually Impaired Cricket Team. "It's been a manic, whirlwind eighteen months. I'd not long been a coach when I was drafted in to train the UK team. As a VI cricketer I have spent years trying to get into the England squad but now I am a coach at international level - that's as good," said Martin, 56, who has very limited vision due to Stargardt Disease. Martin played a key role on the coaching team for the squad of 18 women and girls, aged from 15 to 74, who travelled out to the Caribbean and came back celebrating success. "We beat them 4-1 so I would say that was very successful. We played 3 development matches and 2 International games. I have also been invited to go back and coach the West Indies team, which is quite a pat on the back for me, so I must have been doing something right even though I am visually impaired." Martin believes that as a VI cricketer himself he has the edge over sighted coaches because he has a basic understanding of people's needs. "Everyone has different sight levels, different levels of fitness we start with the basics and build on that. We were complimented on how well organised our girls were." His role as coach gives Martin a great deal of satisfaction because he believes that sport is a good way of encouraging visually impaired people to be independent. "Taking girls on who have never been able to see a game of cricket and explaining this is the ball, these are the stumps, it's slow progress but then they get to play in an international game." As well as going back to coach cricket in Barbados is also trying to help visually impaired children in schools in by sending out equipment for them. "The cricket kit we can help with but if anyone at SRSB has any sight aids they are not using magnifying glasses, talking watches, anything sitting in a cupboard they are not using if they could bring it in and I will arrange for it to be sent out. I made memories I will never forget and I would like to do something to help." Listen to Microsoft's Soundscape App Creates a 3D Audio Map to Enhance Your Exploration in Podcasts. All you need is an iPhone 5s or newer and some stereo headphones to hear left/right cues! CONGRATULATIONS once again to Martin Wilson. He has been voted Disabled Coach of the Year. Well done once again Martin. MY BLIND DRIVE... Ever since I can remember I have always wanted to drive. This Blind drive was my first time. I thought I would only ever be a passenger. I awoke with a few nerves but I was raring to get behind the wheel. Even though I was nervous I still looked relaxed, the instructor making me feel at ease. I forgot to keep hold of the steering wheel but the car was still moving. It was so different to any dream I have ever had and for the Blind drive I felt so glad. iDentifi is a new App from Apple which enables Sight Impaired people to take a photograph of an object and then the App will download the photo image and read what it is. This is a free App for Apple users the links below will first show a video of the App in action and the second link downloads the App. For those of you who receive this newsletter by email fundraising competition cards are now available from SRSB please callJane on 0114 2722757. Our SVIWG team of 14 met at SRSB on 26 September 2014, to borrow one of their mini buses. Our team: Visually impaired - Susan Hill, Hillary Myers, Alan Rolfe and Eric Andrews and Guides - Christine Hewitt, Margaret Patrick, Joyce Harrison, Anne Rolfe, David Kayley, Steve Myers (driver), Norman Pearson, Brett Marsh, Peter Blackwell and David Cadet. Everyone had a soft holdall and rucksack, which nicely filled our mini bus, and away we went. All expenses are paid for by the above members of our group. We arrived at our accommodation for the next two nights at Santon Bridge Inn. The following morning breakfast was served at 8am and then we were off in our bus to start of Scafel Pike. Here we met up with our Leader, Jeremy and his pal David the back marker. Our route was the same as that used by all the people attempting the challenge of climbing the Three National Peaks within 24 hours. Our challenge was just to prove a Visually Impaired Walking Group could also do it (in previous years we had scaled Snowdon and Ben Nevis). The weather was fair dry, and our timing started from where we parked the bus in the National Trust Car Park. The start was relatively easy, a gentle slope with rocks and grass, with brown sheep grazing. We crossed a footbridge over a dried up river then the going started to get steeper with more rocks. Gradually, we ran out of grass and now there were no sheep, only rocks and boulders - and no path, just more and more rocks and boulders! Small cairns appeared which presumably were the only sign that we were on the right route. It was very difficult going for everyone but especially for the visually impaired. Our guides did their best to guide us zig zagging to try and find easiest routes and most manageable rocks to clamber over. The weather was changeable, windy then light rain. Brett gallantly loaned me his jacket, as I had left mine in the wardrobe, and poor Brett had been overheating pulling me over rocks. Eventually we were in the clouds, with very poor visibility (for everyone)!. Apparently on rare occasions there are wonderful views but not today. We had reached the Summit, so we stayed on top to eat our food but not for long - it was freezing. I asked Jeremy if there was an easier way down. The answer was NO. It was just longer, as our route was almost straight up, so down we started. My level of fitness let me down. I had sprained my ankle a couple of years ago coming down Winnats Pass, and then I had damaged my knee on a fall on Ben Nevis. Both these old injuries did not like Scafel Pike and were giving me a lot of grief. I could not see how my colleagues were managing, but I am sure they were also struggling. However, after a couple of bad falls, where both my guide and myself finished horizontal, we had to change our method. We had been lucky not to sustain any serious injuries, from about 2/3 of the way down I was guided down with a guide either side of me. This proved a very good method, and there were no further falls. I OWE MY GUIDES A DEPTH OF GRATITUDE. Do you receive the Sheffield Talking News? It is produced weekly on tape, CD or memory stick. You can be provided with a boombox on which to play a memory stick. You simply receive a yellow plastic envelope containing the newsletter and when you have read the newsletter, which consists of news from the Star and other local publications and some dates of upcoming events, you simply return the recording to the yellow envelope, turn over the address label and pop the envelope into a post box. There is also a magazine which is included on the recording which is replaced every two months with items from a variety of publications plus a quiz. If you would like to try the talking newspaper either ring the STN organisation on 278 0440 and leave your name and phone number on their answer machine or ring Betsy Wilson and leave the same information on my answering machine if I am out.